Everybody wants to have a dream wedding and decoration plays a major role in making it perfect and memorable. To create an exclusive look, we need to pay attention to the centerpieces and design them innovatively. Using silk wedding flowers can help us to lend a unique look to the centerpieces and make people appreciate our taste. Silk wedding flowers can be used creatively along with other materials to create a lovely and memorable wedding decoration. You have to choose the flowers depending on the season and the theme of the wedding. 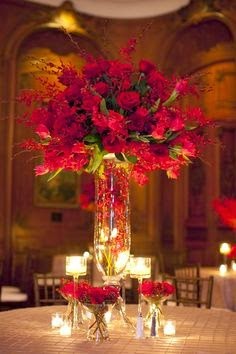 Here are a few ideas that you can implement in your wedding to create your own elegant and unique centerpieces. If you’re getting married in the spring, you can go for soft blooms to create the centerpieces. Use clay vessels to hold the blooms and you can achieve a simple yet elegant look. A winter wedding needs more color and brightness to fight off the dullness. Pine branches and red zinnias would make a lovely combination. However, if you are ready to surprise your guests, go for a red cabbage centerpiece. Yes, a red cabbage along with zinnias when placed in a wooden box makes for an unusual centerpiece idea. It’s easy to design and it will catch everybody’s attention. Are you getting married in the summer? Warm weather calls for some soothing effects and hydrangeas would be perfect for the occasion. You may choose them in single colors like purple or mix a few and create a more colorful bouquet. They come is so many different colors that it’s hard not to find the color theme of your wedding when shopping for them. A fall wedding can allow you to be creative and innovative with your ideas. You can use colorful leaves with fruits and flowers to set the centerpieces. Craft papers and ribbons can be used for an added effect. Are you romantic by nature? Roses and tulips will allow you to create a soft romantic wedding. Use them along with leaves and take interesting urns to hold the entire arrangement. Even candles can accompany them to complete the look. Artificial rose petals are easily available and very inexpensive. These can be used to accent tables, runners or just drop them into a vase with water and a floating candle for a romantic touch.